There is growing evidence that the gut microbiota and its bacterial genome affect host’s physiology. In the AMIPEM team, our projects concern the interaction between food and gut microbiota as a factor involved in the development of human pathologies mainly focusing on metabolic and brain diseases. Thanks to the unique tool constituted by Anaxem (germfree (GF) facilities of the MICALIS Institute), we developed strategies based on microbiota transfer (from animal models or human patients) to GF rodents in order to prove the causal role played by the gut microbiota in these pathologies. Concurrently, from 2015 to 2017, the NIM team studied how the gut microbiota influences the regulation of food behavior and the plasticity of the intestinal epithelium. Due to complementary expertise and common interest for metabolic diseases and brain functioning, the two teams have merged in September 2017. The team is currently divided in two groups, one focusing on brain diseases (Head: S. Rabot; Participants: L. Naudon, V. Daugé, C. Heberden), one focusing on metabolic diseases (Head: P. Gérard, Participant: V. Douard). Engineers and technicians of the team contribute to the research of both groups. From 2015, we developed two main projects: Role of the dialogue between the microbiota and the brain in the maintenance of energy homeostasis in response to high fat/high energy diets (HFHE). The contribution of the microbiota on outcomes of nutrient malabsorption. Exposure to HFHE causes a transient overeating in mice, followed 1-2 days later by a normalization of the energy intake. This regulation is supported by the plasticity of brain circuits that control appetite, which is essential to prevent the obesity and progression of associated metabolic disorders. We found that the intestinal microbiota adapts in 1 d in response to the food change, parallel to a deep hypothalamic remodeling. The absence or modifications of the microbiota also change the food intake behavior adaptation to the HFHE. Overall, our results suggest a role for both the microbiota and the gut-brain axis in the food intake adaptation (overeating and normalization phases). In addition to lipids, sugars are also largely present in the Western diet and their role in the development of metabolic disease is now well recognized. We assess the interactions between sugar malabsorption, the microbiota and eating behaviour. In a collaborative project, we also assess the impact of the structure of food matrices on nutrient availability, gut microbiota and host physiology. We showed that protein emulsion structure regulates digestion kinetics and gastrointestinal physiology, concomitantly with modifications of the gut microbiota composition and activities. Overall, our results show that the distal digestive tract adapts in response to changes in the amount or nature of the nutrients likely as a consequence to modifications of bacterial luminal stimuli. Nonalcoholic and alcoholic fatty liver diseases (NAFLD and ALD, respectively) refer to a spectrum of liver damage ranging from simple steatosis to non-alcoholic steatohepatitis (NASH), advanced fibrosis, cirrhosis or even hepatocellular carcinoma. A dysbiosis has been associated with liver diseases but it was not clear if this unbalanced microbiota is a cause or a consequence of these pathologies. In collaboration with the group of G. Perlemuter (INSERM, Béclère Hospital, Clamart), we transplanted gut microbiota from humans or mice to GF mice to prove causality. By transplanting the gut microbiota from mice with or without NAFLD to GF mice, we showed that the propensity to develop NAFLD features, including hyperglycemia or steatosis, is transmissible by the gut microbiota. We found that gut microbiota markedly impacts the lipid metabolism in the liver, independently of obesity. Moreover, bacterial species associated with NAFLD-resistant and NAFLD-prone phenotypes have been identified. Regarding ALD, we first showed that a specific dysbiosis is present in alcoholic patients with a severe alcoholic hepatitis (AH). GF mice colonized with the gut microbiota from a patient with severe AH developed more severe liver inflammation, higher liver necrosis, greater intestinal permeability and higher translocation of bacteria than GF mice colonized with the gut microbiota from an alcoholic patient without AH. We were also able to identify specific gut microbes and bacterial metabolites associated with microbiota-triggered alcohol-induced inflammation. The next steps were to identify the bacterial species responsible for and the mechanisms involved. For that purpose, we established a collaboration with Pr Liping Zhao (Shanghai Jiao Tong University, China), who isolated a bacterium from the gut of a morbidly obese human volunteer with severe fatty liver. This bacterial species, Enterobacter cloacae strain B29, induced NAFLD, as well as increased adiposity and insulin resistance, in GF mice on high fat diet (HFD). We showed that both lps on the bacterial side and TLR4 on the host side must be intact to trigger NAFLD. Altogether, our results showed that Gram-negative pathobionts overgrowing in obese human gut can work as causative agents for NAFLD with LPS-TLR4 crosstalk as the essential and most up-stream molecular event. While HFD are commonly used to induce obesity and associated metabolic disorders, the interactions between bile acids, dietary fat source and the gut microbiota and their influence on host metabolism are poorly understood. In a French-German project, we investigated the metabolic consequences of diets enriched in primary bile acids with or without addition of lard or palm oil, in conventional and GF mice. In combination with bile acids, dietary lard enhanced fat mass accumulation in colonized, but not in GF mice when compared to palm oil. This was associated with impaired glucose tolerance, lower fasting insulin levels, lower counts of enteroendocrine cells, and increased steatosis. Our results indicate that lard in the diet had a detrimental impact on host metabolism when combined with bile acids, but only in the presence of endogenous gut microbes. Similarly, we demonstrated that HFD-induced glucose intolerance depended on the composition of the gut microbiota while obesity did not. These studies highlight the need for taking into account both the dietary fat source and microbiota composition when interpreting data from diet-induced obesity models. We have previously isolated the first cholesterol-reducing bacterium from human feces. 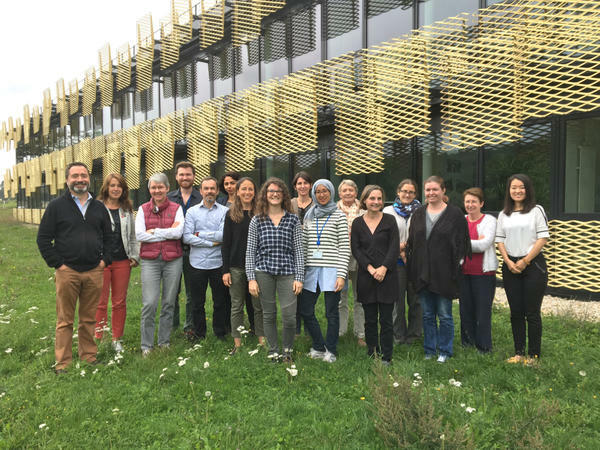 To further dissect the interaction between intestinal bacteria and host cholesterol metabolism, we established a collaboration with clinicians (K. Clément, P. Lesnik, ICAN, Paris). We first showed that depletion of the gut microbiota in mice strongly impacts plasma cholesterol level, cholesterol synthesis and enterohepatic circulation. Moreover, transplant of the microbiota from humans harboring elevated plasma cholesterol levels to mice conferred high plasma cholesterol levels to the recipient mice. These results indicate that the intestinal microbiota determines circulating cholesterol level and may thus represent a novel therapeutic target in the management of dyslipidemia and cardiovascular diseases. Brain maturation in early life is shaped by genetic and environmental factors, and disturbances of this process could favor a vulnerability to brain diseases. Our hypothesis is that gut microbiota dysbioses, occurring in postnatal period during gut colonization, or later in life, could impair brain development and functioning and, hence, participate to the pathophysiology of psychiatric disorders such as anxiety and depression. Our first investigation in the field was based on results showing that GF mice subjected to an acute stress exhibit an exaggerated corticosterone secretion and a reduced anxiety-like behavior, compared with conventional counterparts. We expanded these findings by showing that GF rats also had a greater corticosterone response, but displayed a greater anxiety-like behavior, compared with conventional rats. Following this basic study, our aim was to determine if gut microbiota could contribute to the deleterious effects of chronic stress in early life or later in life. In this regard, experiments with microbiota-controlled rodents subjected to maternal deprivation in childhood or to unpredictable chronic mild stress in adulthood are in progress. Besides extending our knowledge of the influence of gut microbiota on anxiety and mood disorders induced by various stressful situations, we also aimed at identifying which gut microbiota products could be involved. Several oxidized indoles (called oxindoles) are anxiogenic molecules, and their precursor, indole, originates exclusively from gut microbiota catabolism of tryptophan. On this basis, we hypothesized that a gut microbiota dysbiosis leading to an excessive indole production could participate to the pathophysiology of anxiety and mood disorders. We showed that indole overproduction in the hindgut of rats induced anxiety-like and depressive-like behaviors. In parallel, brain oxindole concentrations increased and the vagus nerve was activated. Thus, a gut microbiota metabolite can signal the brain through autonomic nervous system activation and/or systemic metabolic derivatives, and ultimately induce behavioral impairments. Those preclinical findings suggest that people whose gut microbiota is highly prone to produce indole could be more likely to develop anxiety and mood disorders. To test this hypothesis, we first addressed the issue of the inter-individual variability of indole production potential in human gut microbiota, in collaboration with E. Maguin and M. Rhimi (INRA, UMR Micalis). In silico investigation of metagenomic data focused on the tnaA gene, which encodes the enzyme catabolizing tryptophan into indole, definitively proved this inter-individual variability.